The recently formed producing team of H. Clay Blaney and C. Peter Jaegar sked rehearsals for Fritz Rotter’s mystery comedy, “The Devil Also Dreams,” to start July 1. Reginald Denham will direct an all-star cast, which will include Francis L.Sullivan. In lieu of the usual road break-in, a few stops at top silo theaters are being booked to get under way in late July. Lester Al Smith has been signed by the firm as general manager. “The Devil Also Dreams,” a comedy melo sponsored by H. Clay Blaney and Peter Jaeger, gets into rehearsal Monday (10). A seven-week break-in tour of top silo stands is scheduled with a Stem opening in late September. 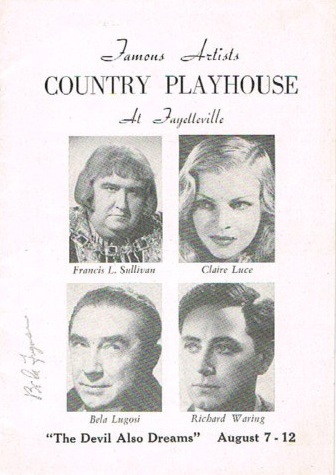 Cast includes Claire Luce, Francis L. Sullivan, Bela Lugosi, Richard Waring and Oswald Marshall. It was rather pleasant to meet a couple or three actors who looked like actors. The summer theatre tradition, especially among the younger thespians, runs to blue jeans and sweat shirts. So when Claire Luce appeared, complete with long blonde hair, black dress, floating scarf, arranged a là turban, and smoked her cigarette in a long red holder, it was a change at any rate. 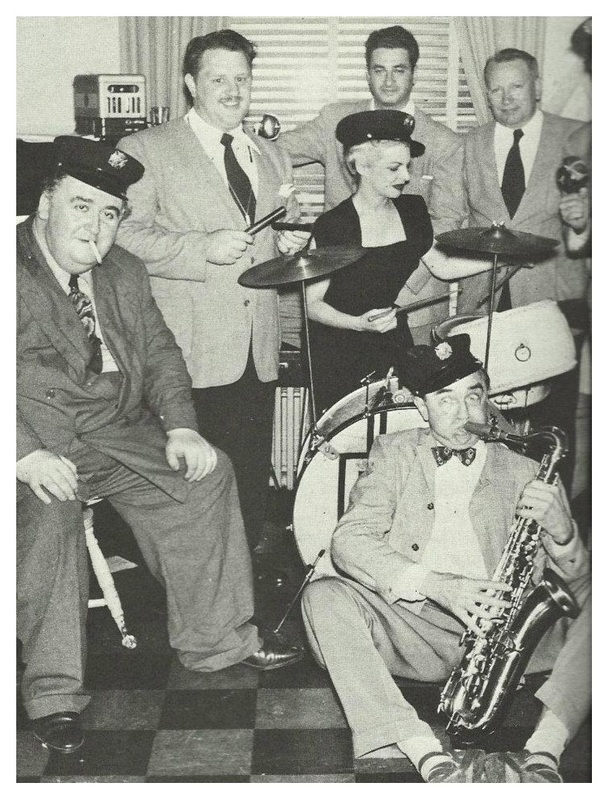 Then there was Richard Waring, a matinee girl’s dream, and Bela Lugosi—the old charmer—and Francis L. Sullivan, the epitome of dignity and simple friendliness. 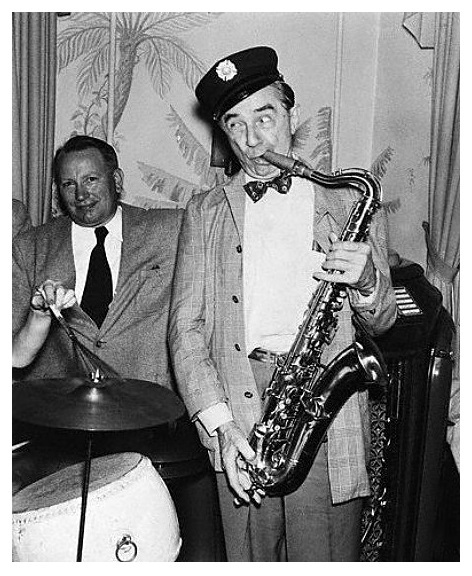 Bela Lugosi was very busy making a fuss over the host at the Fayetteville Inn, where he said he had the time of his eventful life last summer…along with his pal, Paul Lukas. The visiting stars will stay there this summer. Bela kisses your hand and begs you to come backstage to see him…and you know he wouldn’t recognize you if he fell over you within the next 10 minutes. A very nice guy. Bela Lugosi, the screen horror-man who became famous for his portrayal of Dracula, has had just as much trouble getting away from that fiendish character as have millions of movie goers whose dreams he has haunted. In fact, Lugosi says that the part has become to him something of a Frankenstein, a man-made monster turning on its maker. It has taken Lugosi 23 years to get away from his monster. Lugosi, who turns out to be a soft-spoken charming chap with old-European manners, was born in Hungary and trained as an actor. Training there was quite a bit different. If one wanted to be an actor he had to attend the Academy of Theatrical Arts in Budapest and get a degree just as a doctor, lawyer or engineer has to do here. It was a tough grind, but if one succeeded in pulling through, as Lugosi did, one was a professional man, an artist whose social standing was way up there. Work, too, was pretty well guaranteed because each city of 50,000 or more had a municipally financed theatre. Budapest talent scouts would tour such theatres and if an actor looked good to them he was invited to the capital for a guest performance. And if that succeeded, the actor was set for life—with a full-time job, three months vacation and so on. The political unrest in postwar Hungary interfered, however, and Lugosi went to the United States in 1919. 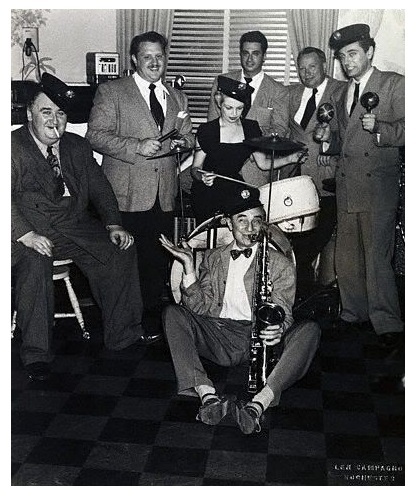 Unable to speak English, he formed a Hungarian language theatrical group which lasted for three years, by which time Lugosi had mastered enough English to play romantic leads on Broadway. “That was a long time ago, so I was justified,” he recalls. It was in 1927 that a Broadway producer was looking for a man to play Dracula. American actors, says Lugosi, were unable to tackle the part because most of them had been trained to develop their own personalities, while in Hungary actors were trained to subdue their own personalities and thus be able to play any part. In any case Lugosi got the part, was fired after five days of rehearsal, was rehired and played the role so well that he has done little else since but horror parts. After making the movie version, Lugosi was signed to play the monster part in Frankenstein, but he didn’t like it. “All I did was grunt and wear a lot of padding,” he says. Lugosi tried to quit the part, but had to agree to find a substitute. He found Boris Karloff, then a bit paleyr, and recommended him for the part. “So, you see, I creatred another monster for myself. Until then I was the only horror man in the movies,” the Hungarian actor smiles. It was “20° colder inside” at the Chateau Laurier last night—not because of any air-conditioning system, but solely due to the presence of some of the entertainment world’s most chilling personalities. 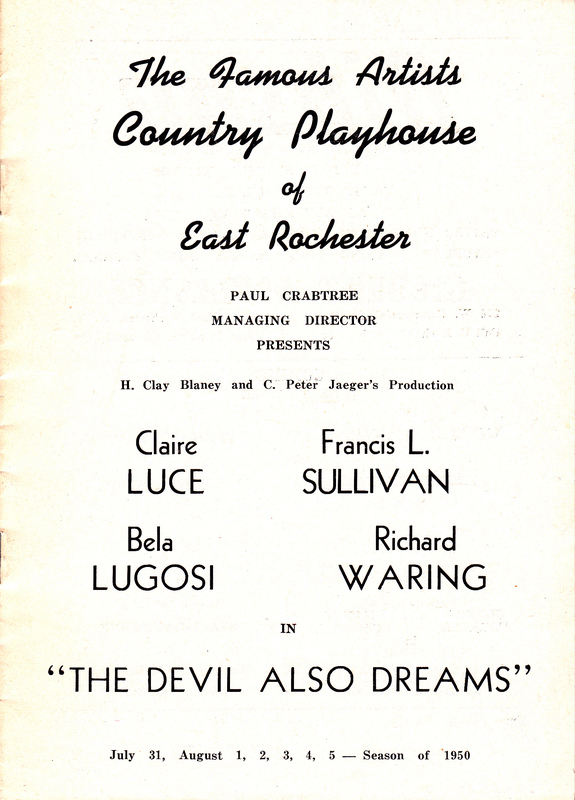 Responsible for at least 15° was Bela Lugosi, main name in the cast of The Devil Also Dreams, a new play by Fritz Rotter and Elissa Rohn trying out with considerable success in Toronto, Montreal and Ottowa prior to opening on Broadway next month. 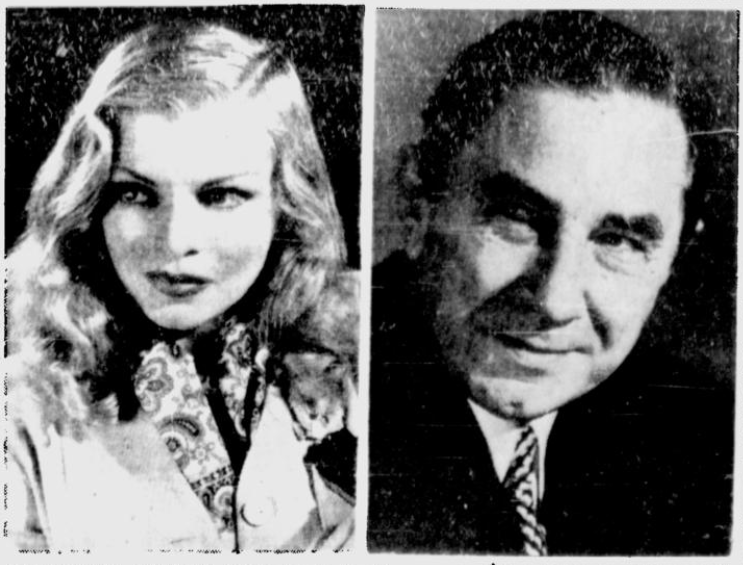 Others in the cast of the play—which is slated for a one-night stand at the Capitol tonight are Claire Luce, Francis L. Sullivan, Richard Waring and Oswald Marshall. Mr. Lugosi, wearing a most unsinister bow tie, welcomed reporters to his room last night without so much as a snarl. He looked remarkably happy for a vampire who hadn’t had a blood highball all evening. But far from yearning for a little hemoglobin, he was hoping he’d never have to look a red corpuscle in the face again. He likes it, but he’s not quite used to it. 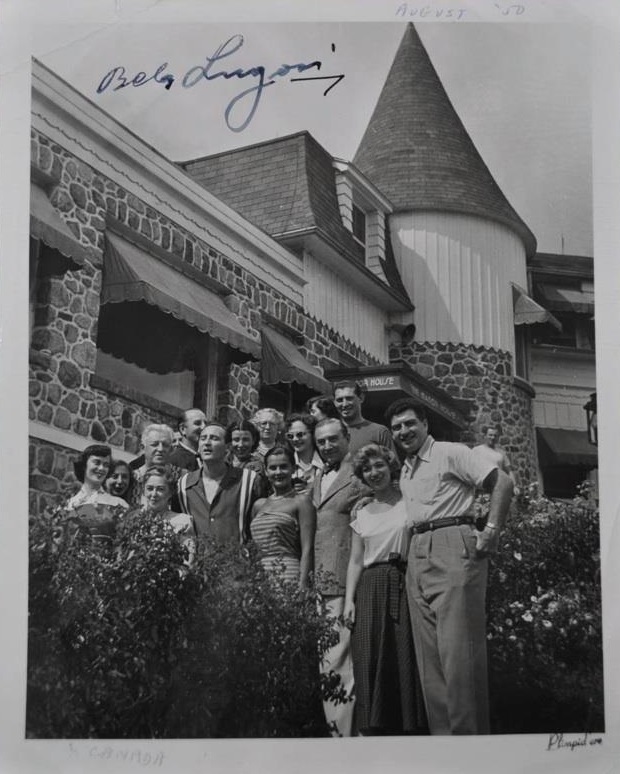 Mrs. Lugosi, who travels with him, says the first time he played the new comedy-drama, her husband was almost pushed off base when the laughs started. He just wasn’t expecting it. Now, when the laughter doesn’t come, annoyance molds his face into the scary expression that made him tops among the nastiness boys. In The Devil Also Dreams, he plays the part of a broken down old actor employed as a butler by a successful writer who has run out of ideas. The writer stumbles on a young playwright with a new play which he palms off as his own. BEWARE, MISS LUCE: Bela Lugosi, the old Dracula man, casts a glittering eye on attractive Claire Luce. 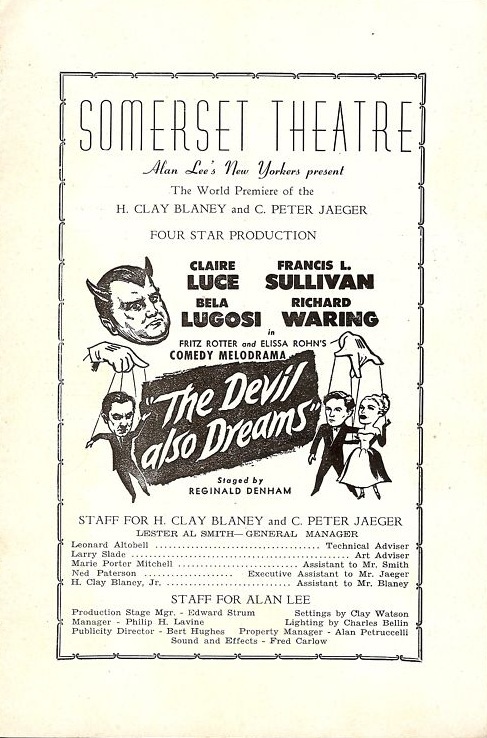 Both are starred with Francis L. Sullivan, the celebrated British actor, in The Devil Also Dreams, the comedy-melodrama coming to the stage at His Majesty’s Theatre on Tuesday, Aug 22, as the first visiting play of the 1950-1951 season. Playing a pre-Broadway engagement of five days, starting Tuesday, Aug. 22, The Devil Also Dreams, will serve to inaugurate the legitimate theatre’s 1950-51 season in Montreal. Presented by H. Clay Blaney and C. Peter Jaeger, this new comedy-melodrama offers a four-star group of some of the stage and screen’s most outstanding personalities. Heading the cast is Claire Luce. Miss Luce was a sensation in London and New York in such successes as The Gay divorcee and Of Mice and Men. 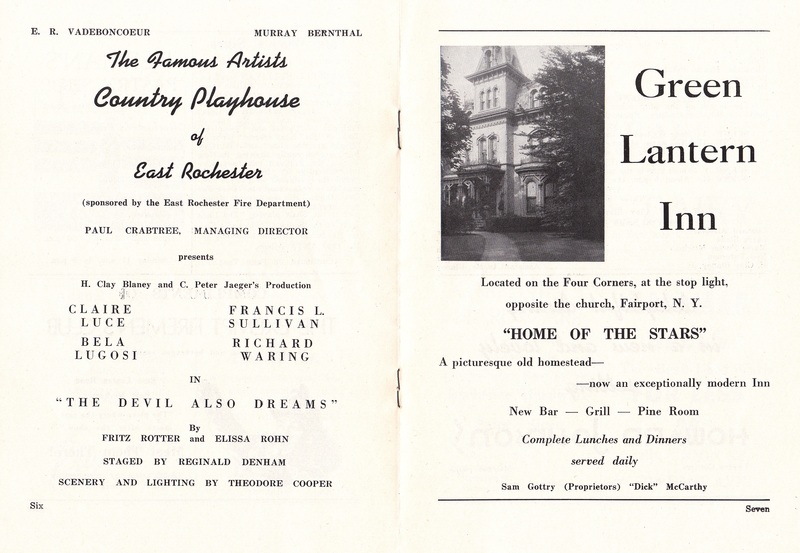 Co-starring with Miss Luce is Francis L. Sullivan, celebrated British star of stage and screen, Bela Lugosi, the Dracula horror man, and handsome Richard Waring, Ethel Barrymore’s co-star in The Corn is Green. The Devil Also Dreams is directed by Reginald Denham, perhaps the best mystery play director in the theatre today. He has to his credit, either as author or director, Ladies in Retirement, Wall Flower, Portrait in Black, The Two Mrs. Carrolls and nearly a score of others. The Devil Also Dreams was written by Elissa Rohn and Fritz Rotter. 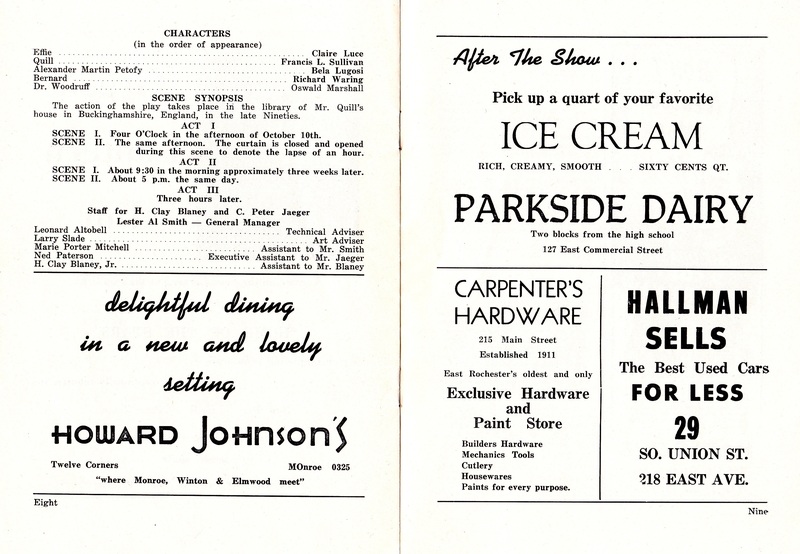 Mr. Rotter’s best previous play, Letters to Lucerne was voted one of the ten best plays in 1941. The Devil Also Dreams is a mystery comedy which takes place in the mauve London of the 1890’s. The plot revolves around an aging playwrite (Francis Sullivan) who has finally come to realize that his fast failing writing can no longer hold the dubious affection of the girl (Miss Luce) whom he has brought up from obscurity to London’s most toasted leading lady. In a desperate effort to prevent the beautiful but designing lady from leaving him he resorts to attempted plagiarism of the literary talents of a brilliant but unknown young playwrite (Mr. Waring). Eventually murder becomes necessary for concealment. Aided and abetted by a half-maniac butler (Mr. Lugosi), the homicide attempts and their results provide the thrills and laughs of the play. Before appearing here, The Devil Also Dreams has had three weeks of rehearsal in New York and three weeks of tune-up performance in Providence, Syacuse and Rochester. 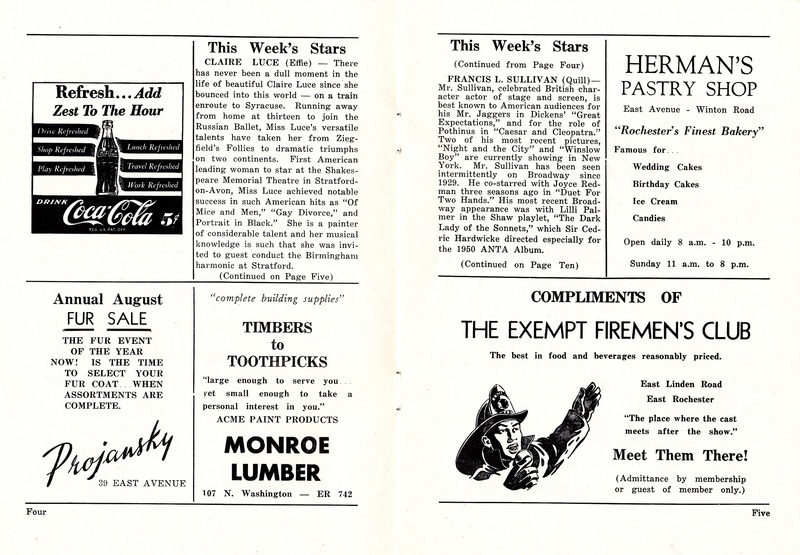 After playing Montreal, Toronto and Ottawa, the new comedy melodrama goes directly to the Booth Theatre in New York City. 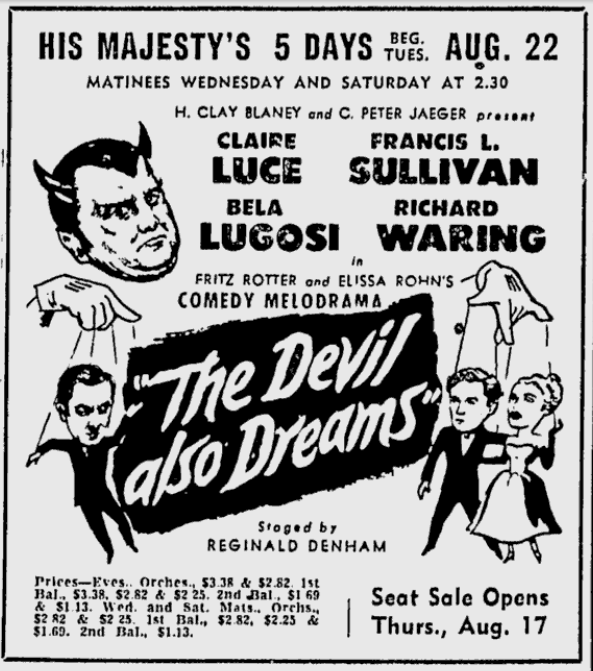 The four-star comedy melodrama, The Devil Also Dreams, which is booked to be the first attraction of His Majesty’s Theatre for the season 1950-1951, will play a five-day engagement at the theatre beginning Tuesday evening, August 22, with matinees on Wednesday and Saturday. The Devil Also Dreams tells a tale of theatrical life in London of the 1890s, and will be played by four well known stars of stage and screen. Claire Luce, who plays the only feminine role, has had a colorful career on two continents. She danced with Fred Astaire in The Gay Divorce, gave a memorable portrayal of Becky Sharp in Vanity Fair, and was the first American leading woman to star at the Shakespeare Memorial Theatre in Stratford-on-Avon. Co-starring with Miss Luce is Francis L. Sullivan, celebrated British character actor. He is best remembered by American and Canadian audiences for his Mr. Jaggers in the screen version of Dickens’ Great Expectations and has leading roles in two current films, Night And The City and Winslow Boy. 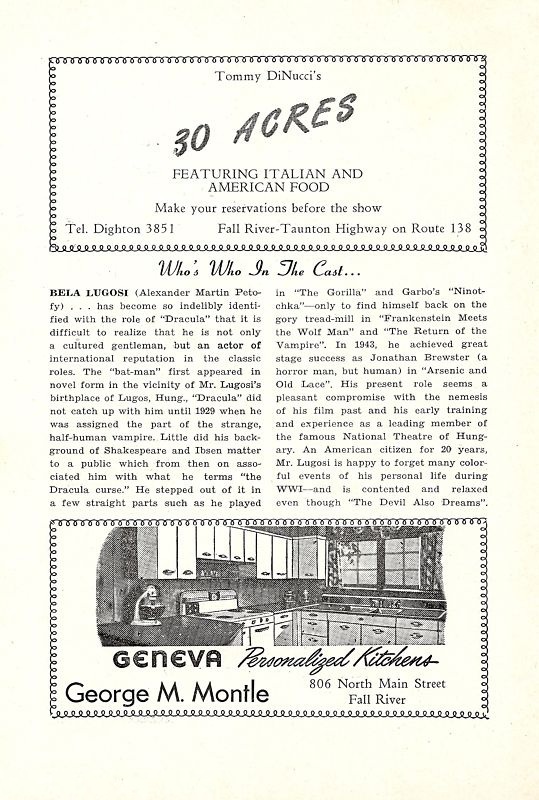 Bela Lugosi, before becoming the Dracula bogeyman of American pictures, achieved European success in Ibsen and Shakespearean roles, and will be remembered for his portrayal of Johnathan Drew in Arsenic and Old Lace. Richard Waring has appeared in many plays, co-starring with Ethel Barrymore for three years in The Corn is Green and recently appearing opposite Eva Le Galliene in a revival of the same play on Broadway. Oswald Marshall is a veteran British actor who has been seen in this country in Victoria Regina, The Barrets of Wimpole Street and I Remember Mama. The action of The Devil Also Dreams revolves about the efforts of a famous aging playwright (Sullivan) to hold the affections of his mercenary young actress mistress (Luce) when a young writer brings a promising manuscript to him for criticism. The playwright plans to steal the play, and – with the aid of his half mad butler (Lugosi) – murder the young author. 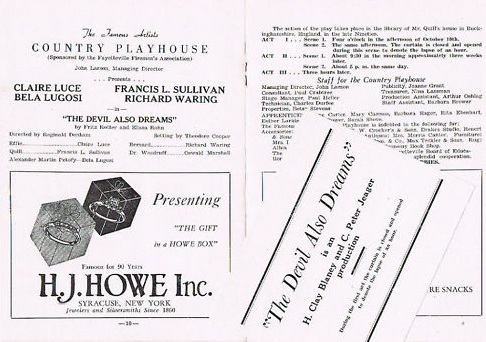 A new play The Devil Also Dreams will herald the opening of the legitimate theatre’s 1950-51 season in Montreal. This comedy melodrama, written by Fritz Rotters and Elissa Rohn and directed by Reginald Denham, starts a five-day engagement Tuesday with usual Wednesday and Saturday matinees. 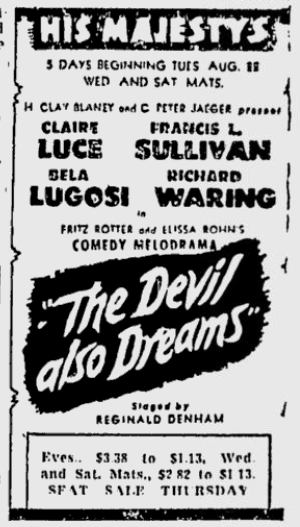 Playing a short pre-Broadway tour The Devil Also Dreams boasts stage and screen stars such as the lovely Claire Luce, rotund British star, Francis L. Sullivan, the Dracula horror man, Bela Lugosi, and the handsome ex-Ethel Barrymore leading man, Richard Waring. This comedy melodrama, located in London, has as its central character an aging playwright named Quill. Many stage successes have given him an opulence that extends from his purse to his girth, also a young mistress of unusual beauty and talent. Quill has molded her into London’s favorite leading woman for his many brilliantly written stage successes. However, with age and avoirdupois comes senility and the once great brain can no longer fashion the words and scenes on which her talent and beauty depend for development. The girl realizing all this, is leaving Quill. To hold his lady the playwrite resorts to plagiarizing the fine but undeveloped writing talents of a young author who has, with awe and reverence, submitted his first play to the master for criticism. Successful larceny in this instance involves the complete elimination of the up and coming young man. To aid and abet this homicide, Quill utilizes the services of his half mad butler, an old Shakespearean actor. The evening selected for the demise of the young writer arrives, as does an unexpected visit by the old family doctor. This unforeseen development unfortunately, or fortunately, depending on the side receiving your cheers, upsets the vehicle bearing the fruit that causes Adam’s downfall. Things begin to happen in a fast, furious and funny manner. The situation becomes one that only a devil could dream. Theatregoers will be privileged to view all these carrying ons prior to Broadway where the play will be introduced in mid-September by its sponsors H. Clay Blaney and C. Peter Jaeger. 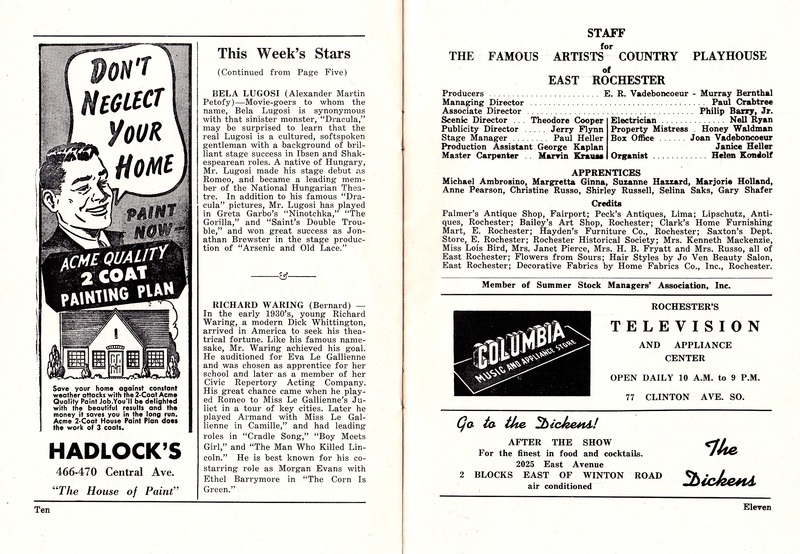 The 1950-51 theatrical season will open tonight at His Majesty’s when the management will present as its first road attraction, the four-star comedy melodrama, The Devil Also Dreams, written by Fritz Rotters and Elissa John, and produced by H. Clay Blaney and C. Peter Jaeger. The engagement will be for five evenings and two matinees Wednesday and Sunday. The Devil Also Dreams, a tale of theatrical life in London of the 1890s, will be played by four well known stars of stage and screen. Claire Luce, who plays the feminine role, Francis L. Sullivan, who was last seen in the motion picture, Night And The City , star in the play. Bela Lugosi, known the world over for his performances as Dracula and Frankenstein, will be seen in an important co-starring role. He will also be remembered for his portrayal of Jonathan in Arsenic and Old Lace. Richard Waring, who was co-starring with Ethel Barrymore in The Corn is Green, will also be seen in an important co-starring role. The action of The Devil Also Dreams revolves about the efforts of a famous aging playwright (Sullivan) to hold the affections of his mercenary young actress mistress (Luce). When a young writer (Waring) brings a promising manuscript to him for criticism, the playwright plans to steal the play, and – with the aid of his half-mad butler (Lugosi) – murder the young author. 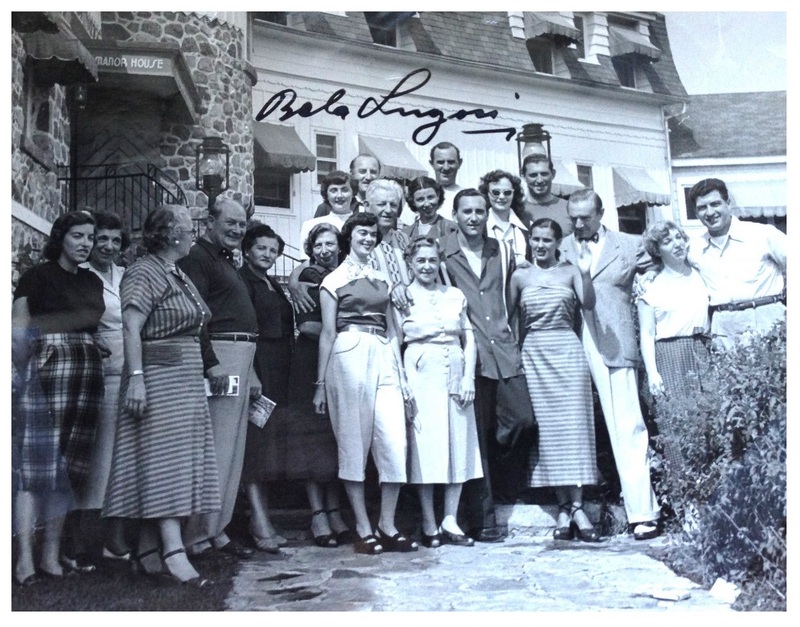 Bela with a group of admirers at the The Manor House hotel in Sainte-Agathe-des-Monts, Quebec. Let us say immediately about The Devil Also Dreams, the first stage production at His Majesty’s opening the season last night that it is here before trying its luck in New York, and that it will take with it there a very exceptional cast. Fritz Rosser and Elissa Bohn, who wrote the play, will have never been better served than they are by the five actors who interpret the authors’ situations and lines. The play itself has a novel twist and some excellent lines and situations. It is not one that is likely to make its mark in dramatic literature or even to make the top dramatic grade on this continent. What we have is the story of an eminent dramatist, and the beautiful star for whom he has written continuous hits, faced with a young playwright with new ideas. The older man sees the opportunity to use the youngster. The star is torn between the two men. Who can supply her with the best medium to exploit her glittering, glamorous personality. Out of this Mr. Rotter and Miss Bohn have attempted to build a convincing three act play. There was a certain feeling all the way through that dialogue and situation were improvised. Often the situations were brilliantly taken. Sometimes we felt a labored effort to make it all go. The dramatic logic was not invariably convincing. But last night that mattered less than might have been expected. It is very well to dogmatize that the play’s the thing but when you have a rare cast which transcends the play itself and builds it up by sheer virtuosity into a first-class theatre experience, then play analysis is slightly out of place. We have little enough acting of this kind out of the films in Montreal in these days. Let us not complain but enjoy what is given us. There is Francis L. Sullivan as the elderly playwrite in peril of losing both his working star and his reputation to a junior genius. The role is written for Mr. Sullivan and he reveals himself as an extraordinarily gifted man of the theatre. We have seen Mr. Sullivan in films and have admired him immensely. But to appreciate his colorful personality, his superb command of English, his sense of the theatre and what it entails in voice, gesture and rhythm, he must be seen in person. That is why every lover of the theatre should take in The Devil Also Dreams. He is ably supported. Clare Luce is a perfect team-mate as the temperamental actress who is the key to the dramatic situation. Miss Luce, like Mr. Sullivan, has a technique which it is both a lesson and a joy to watch. She also has what might be called authority, as added attraction, a rare thing in the theatre. Richard Waring is most winning as the romantic young playwrite: and also an accomplished actor. Bela Lugosi, who is known to most people as a horror man of films, is quite delightfully out of his conventional character. Mr. Lugosi is Mr. Sullivan’s ex-actor butler, who formerly played Hamlet and, while a model in his present vocation, can never forget that he once intoned “To Be Or Not To Be” before an audience. This in itself will make the play worth seeing for many. And then we have the veteran Oswald Marshall who comes in during the final poison party as the attentive, old fashioned English doctor. This adds to the old theatre stuff that never fails. The costumes and setting are well designed but hardly make us think about England in the late Nineties where and when the action is supposed to take place. But this is a minor matter.